Lexbe eDiscovery Platform offers Flex and Annual storage plans, with no set-up or users fees. You can add as many users as needed from your firm or otherwise associated with your case. Monthly or annual charges for usage of the Lexbe eDiscovery Platform Document Review application are calculated based on the highest of usage on the first of a month including the original file uploaded, the search index that Lexbe eDiscovery Platform prepares to make a case searchable, any OCRed versions of files (uploaded image PDFs that did not include text prior to upload), and any case Briefcases of downloaded documents stored in the account. The charge is equal two times the size of 'GBs Received/Uploaded' assumed expansion for PDF and search index creation. 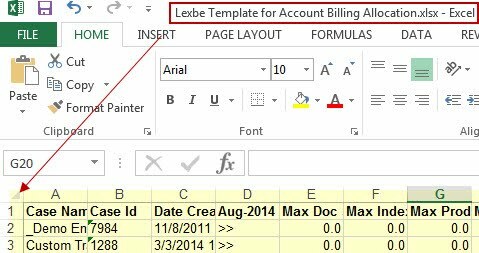 Please note that if you are a new Lexbe eDiscovery Platform customer then we will prorate the first month or apply partial charges for our services, and then bill monthly thereafter. The column 'Current Case Size” reflects the amount of storage that is in each case right now. As long as no data has been deleted, it will match the max billing information. 1- For each case in the account determine the maximum of Documents, Search Index, Briefcases and Productions in GBs. For example, 52.9 GBs + 9.7 GBs + 1.5 GBs + 6.3 GBs = 70.4 GBs. 2- Add those max values together to get the max case size. 3- Sum all the cases in the account to get the max account size. Upload: It will also show the upload unexpanded and upload expanded. Those are the total for the month. 1-Upload Unexpanded: This is the amount of files added into the system before expanding (e.g. unzipping) and processing. However, the number is adjusted to reflect the amount of data uploaded without compression. If you upload a 1 GB of data but you compressed it into a 0.8 GB zip, it will be counted as 1 GB. In other words, it doesn't matter how aggressively you compress the data before upload because it will be counted as if you put it into a zip file with no compression. 2-Upload Expanded: This is the amount of files added into the system after processing and therefore the amount that the case size is increased by. It includes the initial ZIP or PST file. It does NOT include any TIFF files added through a TIFF production upload. It will only count the PDFs created from those TIFF uploads. >TIFF upload. Offers very minor expansions since the Normalized PDF is only slightly larger than the TIFF (they include OCR text). >Zip. It expands a factor 2 since the Normalized PDFs generally are about the same size as the originals. Outliers would be a 1 GB movie uploaded with a 5 KB PDF placeholder. >PST. It expands a factor 2-3 depending on the number of attachments. Lexbe eDiscovery Platform ends up with MSG, Attachments and Normalized PDFs. The max billing is updated nightly. If you do not delete the container file (ZIP or PST) AT the same day it was uploaded, it will be reflected in the max usage. If a case is deleted mid-month it will no longer show up in Manage Cases table, and the current size will reflect this drop in storage (and indicate what next month’s max is going to be). This means that monthly charges based on the highest of usage during the month will still apply. It will then disappear from the calculation the following month. > Free Loading and Processing Services for Natives Files. We offer paid Lexbe eDiscovery Platform customers the service of us loading and processing native files with our 'Free Native Processing+ (to PDF/Native)(requires 6m LEP hosting)' service. With this service we process and load to a paid Lexbe eDiscovery Platform account supported native files without initial eDiscovery processing charge (otherwise $300/GB, declining with volume) and instead charge an account minimum equal two times the size of 'GBs Received' assumed expansion for PDF and search index creation, for the month of load and the next 5 months following. If data is deleted from the account the monthly minimum GBs will still apply. Charges on Lexbe eDiscovery Platform accounts start at $199 for up to 10 GBs per month, and decline with volume. 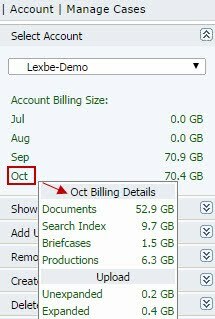 There is no minimum monthly requirement or charge for native files clients self-load to the Lexbe eDiscovery Platform. > Free Loading and Processing Services for TIFFs/Loadfiles. We offer paid Lexbe eDiscovery Platform customers the service of us loading previously TIFF images and loadfiles for you, with our 'Free PDF/TIFF Load+ (load by Lexbe Services, requires 6m LEP hosting)' service. The Free TIFF Load+ (load by Lexbe Services, requires 6m LEP hosting) services requires standard load files, where applicable. With this service we load to a paid Lexbe eDiscovery Platform account previously TIFF files with standard loadfiles, without initial charge (otherwise $90/GB, declining with volume) and instead charge an account minimum of $199/GB (or portion) loaded through this service, for the month of load and the next 5 months following ($132/GB total). If data is deleted from the account the monthly minimum will still apply. The charge could be greater if other data is in the account, or added to the account. Charges on Lexbe eDiscovery Platform accounts of TIFF hosting start at $199 for up to 10 GBs per month, and decline with volume. There is no minimum monthly requirement or charge for TIFF files that clients self-load to Lexbe eDiscovery Platform. As part of processing Lexbe eDiscovery Platform will expand certain supported container files, including Outlook PSTs, Outlook MSGs, ZIP files and RAR files. This allows separation of individual files, including email attachments, and expands the storage used in the system. These expansions will increase the storage used in the case. Lexbe eDiscovery Platform automatically creates a 'normalized PDF' version of all supported file types uploaded to the application. This is done to allow for better document viewing, to increase searchability, to allow Bates stamping at the page level, to allow redaction, to allow document splitting and for other functions. If our software cannot create a normalized PDF a placeholder page will be created, which can be Bates-stamped. This process includes OCR of PDFs and other supported images when available. The original file will be available under the 'Original' tab of the document viewer, and the normalized PDF (a Text-Under-Image PDF or Text-Based PDF) will be available under the 'Doc' and 'Page' tabs. This may be a Placeholder File. The extracted or OCRed text will be available under the 'Text' and search 'Hits' tabs. If the original PDF is already a searchable Text-Under-Image PDF, or a text-based PDF, then no OCR will be done and the original uploaded PDF will be used for the Native, Text and Document tabs. Our OCR procedures are discussed here. Lexbe eDiscovery Platform uses whichever PDF viewer you have installed on your system and associated for inline viewing of PDFs. For many users this is Adobe Acrobat viewer. The Lexbe search index is generally about 35% of the size of the documents stored, but this can vary substantially in any case depending on the document type and can approach 100% of the original document size in some cases. The search index is compressed from extracted or OCR text and allows fast search results. Document coding is generally a very small amount of storage. In general, cases with documents originating native particularly ones with lots of text will have a higher percentage and with documents originating as scanned or TIFF load files, from photos, and including many documents with little text will have lower percentages. For billing purposes we cap the maximum billable size of the search index in an account to 35% of the document size stored. This means that the index size on your bill may be lower than what is reflected in your account if you have a particularly large index relative to document size. We charge a 50% discounted rates from our regular flex case pricing, as our system automatically creates joined PDFs from the single-paged TIFFs. Our system uses the joined PDFs for the document viewer, but there are other advantages to you of the PDFs, including the ability to 'copy and paste' from a PDF and download PDFs. Creating these PDFs doubles the storage size so we half the monthly rate to keep your rate consistent. We'll do the same for other TIFF-based cases you add as well. We won't raise this rate except if part of general pricing changes. Lexbe eDiscovery Platform enables you to create download links of documents from the Browse, Search (Briefcases) and Production pages of the application. These Downloads are in the form of ZIP archives of documents selected for download. They can be downloaded directly with Lexbe eDiscovery Platform, or a secure Shared Download link can be created to share with third parties. These Downloads can be used to Bates stamp PDFs (image or text-based), to create and store Productions, to prepare documents for download and printing and for document sharing. The files created for the download link are separately copied and shared separate from the original versions. Your account will be increased by the Downloads created for the month in which you create it. To avoid charges in succeeding months, you should delete the Downloads when it is no longer needed. In order to bill separately by the case or directly to your clients, please submit a request to our customer support. There is no set up charge for that, but we do charge $10/m for billing of each separate account. If you have questions regarding your plan and current usage, please submit a support ticket to our customer service. If you are a new user and would like us to help you upload standard load files to your case for the first time, the upload fees will be waived for new Lexbe eDiscovery Platform accounts when the data is kept in the case for a full six months; otherwise there is a prorated charge. Non-conforming load files would incur hourly charges, due to the fact that TIFF load files can be non-standard or corrupt, including corrupt or missing TIFF files, corrupt or missing text files, missing or corrupt data, field inconsistencies, file count mis-matches, misaligned or missing metadata, or other non-defined matters. When we receive a non-standard load file, we may be able to partially load or not, depending on the degree of problems and it would incur hourly charges. >The supported load upload is only for a standard conforming load file, per our specs, and non-conforming load files would incur hourly charges. >Please also note that our standard service for return of media for data handling is to use USPS Priority Mail Express Next Day delivery (free of charge), and an upgrade to a faster service will result in a shipping reimbursement charge in addition to the above.